Brad Smith says it’s time for a stronger link between Seattle and Vancouver. A high-tech corridor in the Northwest? Microsoft President Brad Smith likes to tell the story of Samuel Hill, a Minneapolis attorney who did such a great job suing the Great Northern Railway that the railroad company hired him as an executive. Hill went on to help found the Washington State Good Roads Association to promote the paving of roads to connect farms to railways. Hill had a dream of building a Pacific Highway that would stretch from Mexico to Canada and played a role in establishing the Peace Arch in Blaine, dedicated in 1921 to celebrate a century of peace between the United States and Canada. 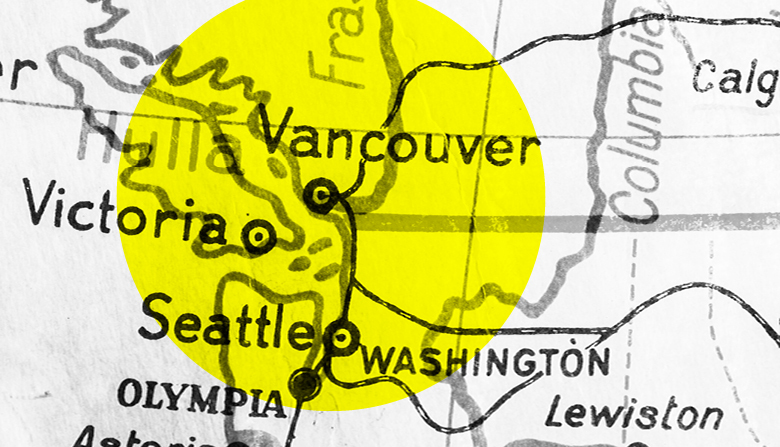 The foregoing is a preamble Smith presents to make the case that it is time to build a high-tech corridor between Seattle and Vancouver, B.C. Microsoft obviously has an agenda here: “There is such a need for talent,” Smith admits. The company announced last year that it would open a 750-person research operation in Vancouver, in part to get around tight restrictions in the United States on providing visas to foreign workers to alleviate a shortage of programmers. Amazon, Zillow Group and Tableau Software also have established operations north of the border. While Vancouver and Seattle both score high on tech talent, they are weaker in other areas, such as biotech. The solution, Smith says, is to “operate a single corridor that is at scale. To build scale, we need to bring people together.” Attracting biotech talent to the Northwest is difficult because scientists worry about where they would go if their move to a Seattle biotech firm doesn’t work out. If the Vancouver-Seattle region were perceived as one market, perhaps that perspective would change. Added scale would also help sectors such as clean tech, computer gaming and film. Smith is offering $1 million of Microsoft’s money to encourage joint projects between the University of Washington and the University of British Columbia (UBC). He hopes it will make the two look to each other for collaboration rather than to universities in San Francisco or on the East Coast. Smith also hopes UBC will join the Global Innovation Exchange, a Microsoft-backed partnership between the UW and Tsinghua University in China that opens in Bellevue this fall. To make the two cities truly a single market, however, would require far easier commutes. Toward that end, Smith is working to complete a feasibility study for a high-speed railway to connect the cities in just 57 minutes. Such a train won’t materialize anytime soon, so in the meantime, Smith is taking smaller steps, such as pushing for floatplane service between Seattle and Vancouver. The notion of a “Cascadia” region binding the major cities of the Northwest has been around for a while. With almost a century having passed since the Peace Arch was built, Smith thinks it’s time to make the cross-border connection a reality.